Euronav are digital distributors for the UKHO ENC services. We are fully trained in the UKHO E-Navigator and Planning Systems. For more information on E-Navigator, visit the UKHO E-Navigator site. 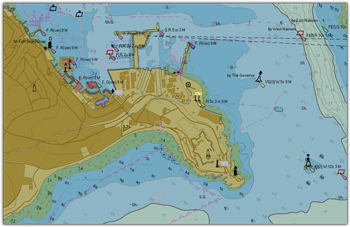 Electronic Navigational Charts (ENCs) are digital vector charts produced to the International Hydrographic Organization’s (IHO’s) standards (S57 Version 3.1 and ENC Product Specification). They are referenced to WGS84 datum and are normally supplied with an official update service which is available for download or by CD. The Admiralty Vector Chart Service (AVCS) brings together ENCs from national Hydrographic offices around the world and new ENC coverage produced by UKHO in co-operation with Foreign Governments to provide comprehensive, official, worldwide coverage. These are fully vectorised charts using the best available data for the area. The AVCS service is available with 3, 6 or 12 month licences and updates are issued weekly. ENCs are S57 charts which have an additional encryption layer known as S63. A number of Inland Waterway Authorities produce S57 charts without encryption and can be used free of charge but requie software capable of reading S57s. The Admiralty Vector Chart Service (AVCS) contains ENC data that meets Safety of Life at Sea (SOLAS) Carriage Requirements for use within Electronic Chart Display and Information Systems (ECDIS). If used with a non-type approved ECDIS system then they do not meet carriage requirements. Australian National Standards for Commerical Vessels (NSCV) states that -in some cases- vessels can use an ECS displaying S57 ENCs and be compliant, as long as the vessel doesn't require ECDIS. More information on which vessels this applies to can be found on the Australian Maritime Safety Authority website. Should I use S57/ENC data? From the 1st of July 2012, SOLAS began the roll out of ECDIS mandation on commercial vessels. ECDIS uses S57 ENCs and when used in conjunction with E-Navigator, keeping digital charts up to date and ordering new ones is straight forward and immeditate. For more infomation on ECDIS manadation, see the Admiralty Resouces page. Which software can be used the S57 ENCs? All ECDIS and ECS that support S57 and the S63 encryption can use S57 ENCs. seaPro supports S57 ENCs and unencryted S57s. Please contact us for quotes and sales.